Carey and I also lived close by each other in our school days. We spent a lot of time at each others houses where we would plan our futures and talk about the perfect guy. I would give her dating advice, which I didn't really know what I was talking about, and she would listen. Somehow our lives didn't turn out like our plans on paper dictated, however she did finally meet her match and now they are getting married. I'm so happy for them because they are really great people and besides that...we are 33 years old! It's our time! 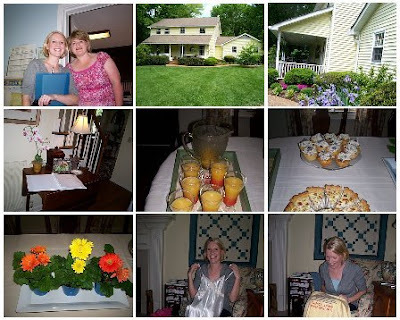 Her lingerie shower was very nice, held at a friends house that was totally adorable. You can't see the words on the gift I gave her, but I always give my teacher friends this frumpy T-shirt for their lingerie gift and tell them to wear it on the first night of the honeymoon! It's really unattractive, but the words are so cute..."Teachers make great lovers..."I'm sure the guys appreciate it! I have one for myself too, I hope I can use it someday!!! !